Australia is a great shopping destination. All of its cities have large commercial avenues full of clothing stores, designer furniture, art galleries and typical local products. With regard to fashion, here you can find own and exclusive brands such as Witchery, Sportsgirl or Creux Velowear, among others. Although if what you are looking for is a typical product to be taken home as a souvenir, in addition to its abundant crafts, you can buy items that follow the traditions of the different aboriginal ethnic groups, and you cannot miss the famed precious stone, opal. Australia is the largest producer of this precious stone that can be found in jewellery stores across the country. 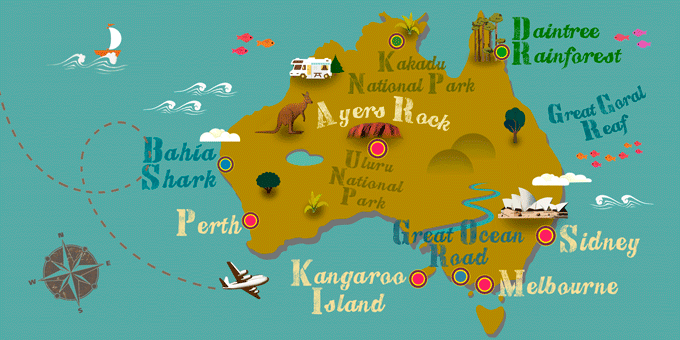 As for the original souvenirs or gifts, do not miss a visit to the main markets of Sydney, Melbourne, Perth or Darwin. If Australia has caught your attention, leave us your number so we can call you to discuss the voyage that awaits you.